Argentina - IYA2009 ~ Astronomy issue: One design of a four stamp set issued by Argentina featuring various observatories located within their borders. This particular stamp design features the Astronomical Complex facilities Leoncito (CASLEO) located in the Province of San Juan. Argentina - IYA2009 ~ Astronomy issue: One design of a four stamp set issued by Argentina featuring various observatories located within their borders. This particular stamp design features a view of the dome of the Félix Aguilar Astronomical Observatory located at the El Leoncito National Park, in the Province of San Juan, as well as, one of its instruments. Trails made by stars during a time-lapse exposure are also featured in the stamp design. Argentina - IYA2009 ~ Astronomy issue: One design of a four stamp set issued by Argentina featuring various observatories located within their borders. This particular stamp design features a view from inside the open dome of the La Plata Astronomical Observatory located in the Province of Buenos Aires. One can see trails of stars in the sky visible through the open dome. Such trails are the result of time-lapse exposures. Argentina - IYA2009 ~ Astronomy issue: One design of a four stamp set issued by Argentina featuring various observatories located within their borders. 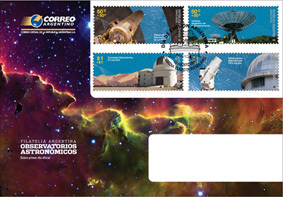 This particular stamp design features dishes of the Argentine Institute of Radio Astronomy located near Buenos Aires. Argentina - IYA2009 ~ Astronomy issue: The four stamps of the set attached to the special cover and cancelled with the pictorial postmark designed for use on the first day day of issue. Argentina - IYA2009 ~ Astronomy issue: The design of first day of issue cancel used on the four stamp set issued by Argentina featuring various observatories located within their borders. 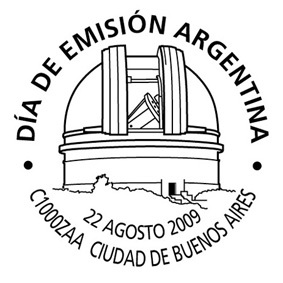 Argentina - IYA2009 ~ Astronomy issue: One of a two design set that were issued to mark the IYA 2009 specifically. 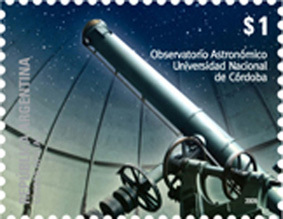 This stamp bears the image of the telescope located at the Astronomical Observatory of the National University of Cordoba. Argentina - IYA2009 ~ Astronomy issue: One of a two design set that were issued to mark the IYA 2009 specifically. 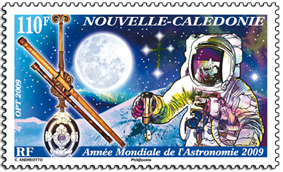 This stamp is part of a souvenir sheet and bears a likeness of Galileo. 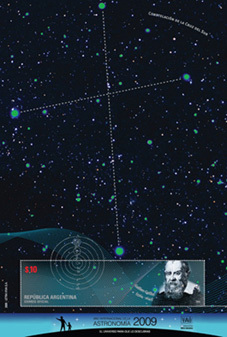 The $10 stamp also shares a diagram of the solar syatem that crosses the perforations into the field of the sheet where one sees the constellation known as the Southern Cross. The IYA 2009 logo is featured at the lower portion of the sheet, below the stamp.